Sur sorry for being MIA the last two weeks. I was working hard on re-vamping my website, and now I am so excited for you to see it! I've organized it so that you can take a look at all of my work from food styling and photography to product photography, capturing beautiful interior images and beautiful people, to taking a look at brands I have worked with over the past year and a half. I cannot thank you enough for your support over the past year and a half. I have a special giveaway coming soon that will celebrate that and YOU! It's 9 a.m. on Monday morning. You are tired, uninspired and in desperate need of a coffee. My go-to? The Wydown at The Apollo. Grab a coffee from The Wydown and walk into an Instagrammable heaven that was designed with the help of the ladies from Salt & Sundry. An environment that encourages you to work hard while being cozy AF. All about that #balance. While the decor and design elements are inspiring enough, I also love the atmosphere that is provided by all of the other creators, students, designers, loungers, and other humans you'll see working there. I have met a few people just from the raw connectivity of human interaction on an early morning, admiring each other's work (so weird I would talk to strangers, right?!). The rooftop is stunning too. I did a photo shoot there last year, and from the pictures you would have never known that this little slice of boho heaven was located quietly on H Street, NE. Take a look at those stunners here. As we all know, the universe has a funny way of working. Emily and I actually went to high school together in Alexandria and ran cross country together (#tbt - I'll dig up a picture one day for your enjoyment). Fast forward to 2016 when I was introduced to the creative world of DC, Emily and I crossed paths yet again in a completely new light. 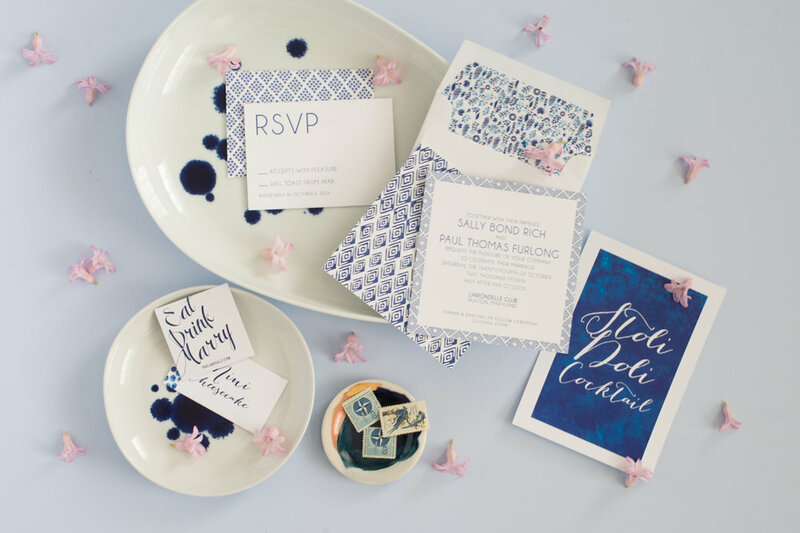 Emily, a Northern Virginia native, is a full-time designer and creator of branding materials, invitations, luxury letter pressing and all things print-oriented. In 2017, she was named Washingtonian Bride & Groom's 2017 "Editor's Pick" in Stationery. While working full-time, she hustled hard on the side to turn her creative dream into her full-time pursuit of creative fulfillment and funds and recently moved to Palm Beach, Florida where she is finding endless inspiration under the palm trees. Jealous. Her unique use of materials such as wood, laser cutting, acrylic, leather, found objects, boxes and patterns make her designs truly stand out. Next time you need custom invitations? Support a local female business owner, and give Emily a shout! By soaking it up with a few products from Blush Med Spa. This weather has been so confusing and inevitably, has thrown off my mind and body. I'll leave my house feeling warm and balanced, and come home with goosebumps and blue lips. If I am too tired to go to yoga or the gym, I draw out a hot, cozy bath situation. I used to think baths were gross / inefficient / only for kids and rubber ducks etc., but then I snapped out of this negative AF phase, turned off my phone, threw some flowers in that water and BAM! Now, it is one of my favorite things weekly (sometimes nightly). I picked up Detox by Herbivore Botanicals the last time I was at Blush, and have added them into my bath routine. I keep eucalyptus in my shower to help ease my mind. I keep my phone far away from me (after I take a picture to share on Instagram, sigh), light a candle, put a face mask on and do this really bizarre thing called relaxing. I can't say enough amazing things about what this has done for me at night to help me fall asleep. My insomnia is pretty awful, and this is one thing that has helped! Another thing that has helped me to relax is my facials from Blush. Read more about my experience and love for them here, and enjoy 30% off when you sign up here!